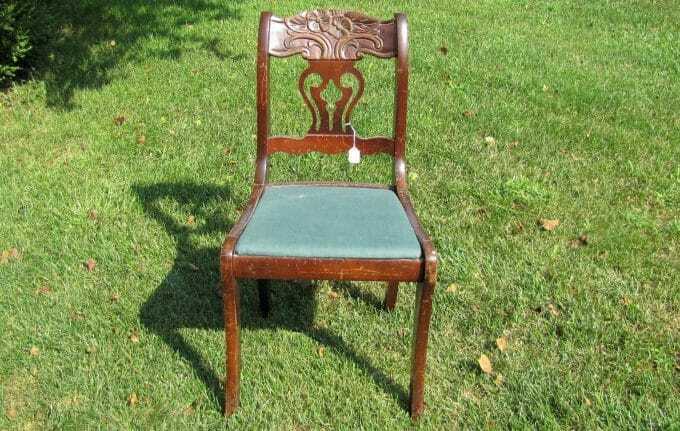 Last weekend I bought this chair at a garage sale. It was really banged up, but was only $3.00 and since it had good bones I felt it could be a good rehab candidate. Sort of the Lindsay Lohan of chairs. It had a cute flower detail on the top. 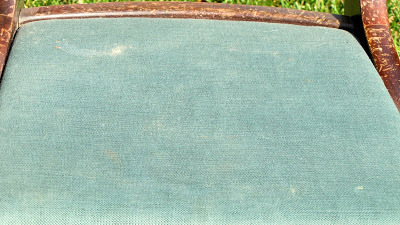 And some really cruddy, really dusty and sort of disgusting fabric on the seat. We don’t even want to think of how many derrieres have sat on this. 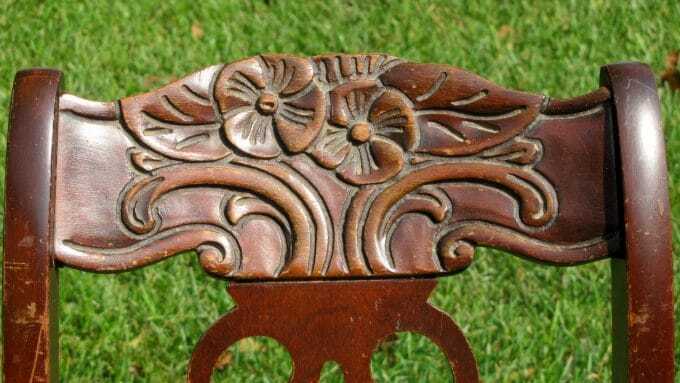 I originally was conflicted as to whether I should refinish its wood stained finish or just paint it, but when I attempted to refinish a small portion of it I realized that this was not a real antique and was made of three different types of wood. I didn’t think it would refinish well, so I went ahead and brought out my paint. 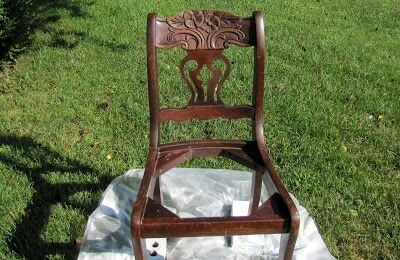 I yanked the seat off of it and applied Krud Kutter’s Pre-Paint Cleaner to degloss the finish. 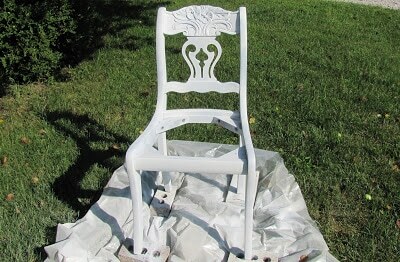 and followed that up with two coats of Rust-Oleum’s Ultra Coverage Heirloom White satin paint. I decided to use the Heirloom White again because I wanted to match another piece in my living room. Besides, you can’t go wrong with off-white. 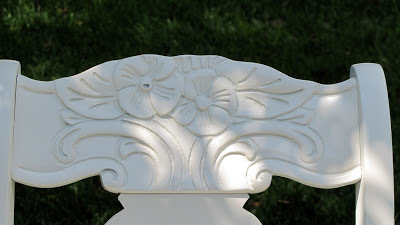 I then distressed it and applied Minwax’s Golden Oak stain over the paint to warm up the off-white a little and highlight the flowers. 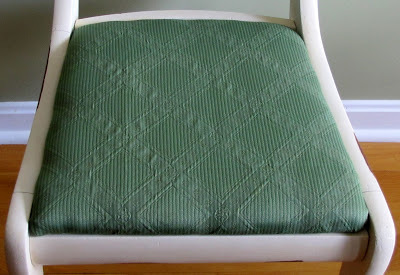 The original seat was a little hard so I added a little more padding to it and then recovered it with a new fabric (after I got rid of all that old nasty fabric that was on there – three different layers of somewhat questionable fabric choices). And here is the finished product. It now matches my table that I re-did a few weeks ago. Super job! The “after” is way much better! It looks great, especiall with that cute table. You did a nice job. Very pretty! Great job! I love the color..it matches perfect with the table you did! Hi, I saw the word “garage sale” and just had to visit. What a fantastic bargain and it looks so much better….so fresh. It looks great with the table. I hope you get years of use out of it. Oh my!!! It looks wonderful!!!! 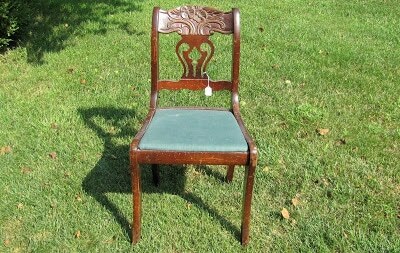 Good evening, I just love how your chair turned out…and what a great bargain?!! I love the re-do. 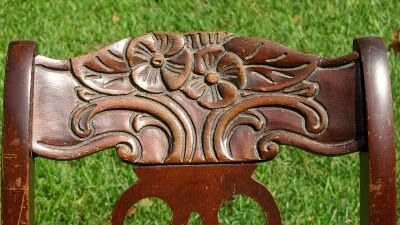 Adding the stain was just the finishing touch that it needed to bring out the carving at the top. Great job! 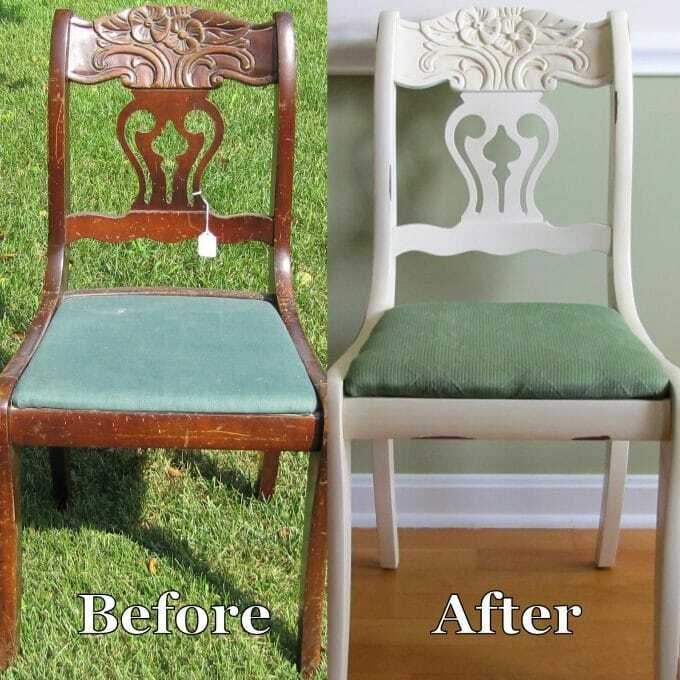 It is amazing what a new coat of paint can do. 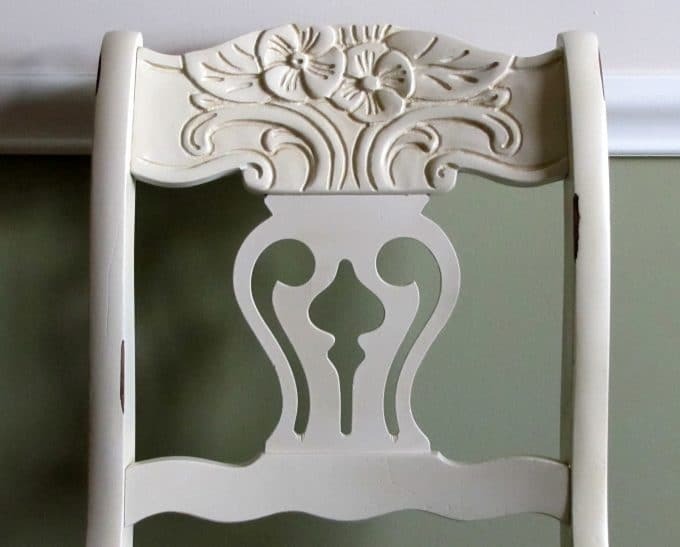 what a beautiful swan from that ugly duckling chair. 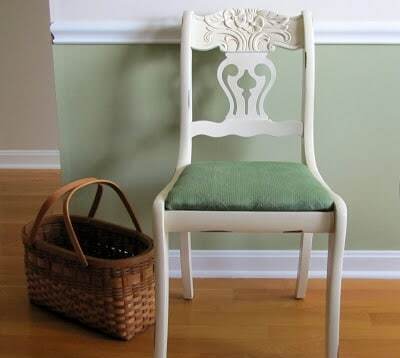 I love the floer carved on the top of the chair and the painting technique you used really enhances that!! it is really beautiful!! 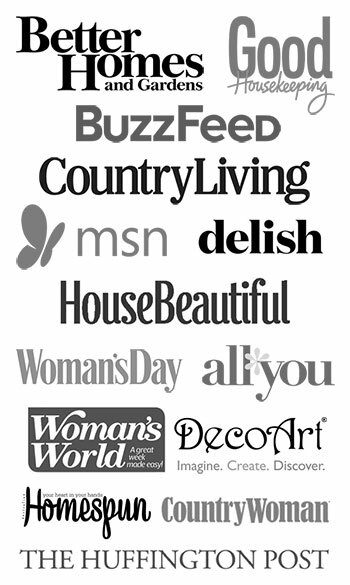 I love the curvy lines and roses. Your redo is great! 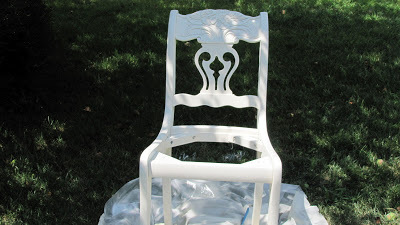 Love, love, loving this chair redo, Pam! It’s beautiful! Fantastic makeover! You’re right, the chair does have good bones and it looks so wonderful now! Great job!!! Love it! Especially next to the green wall! 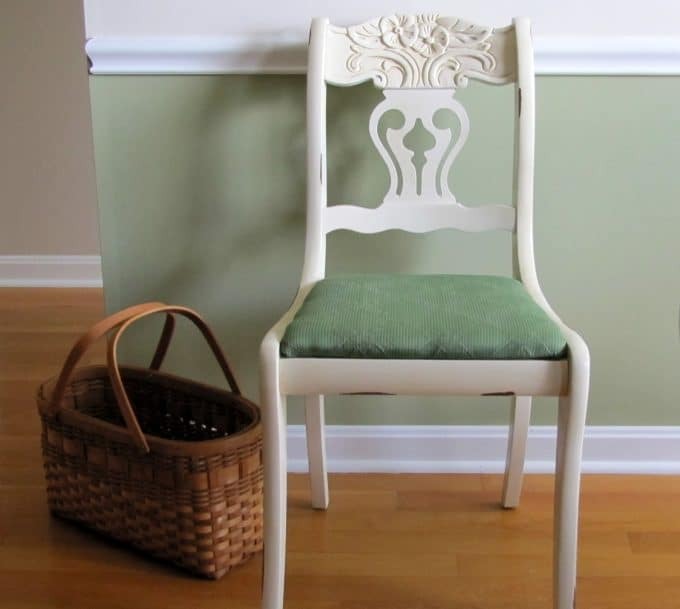 This is a lovely chair and you made it look so much better – well done! 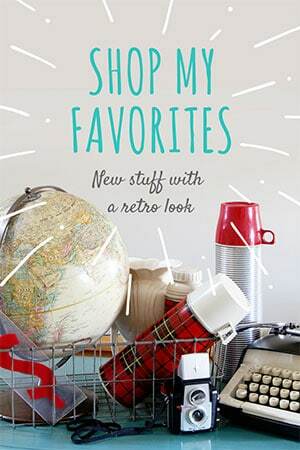 Stop over to enter my giveaway! Very pretty! It had great bones to begin with, and with a bit of paint and new upholstery, you rehabbed it! Such a cute chair and the flowers show up so well now. It looks great with that table. Love the legs on it. I love the chair lets hope Lindsey does as well…she has good bones too! LOL I am visiting from Debbiedoos. That really turned out beautifully! And what a bargain for only $3!!! That’s really pretty! I love the solid fabric you used. Oh my goodness! I love it and the flower detail! 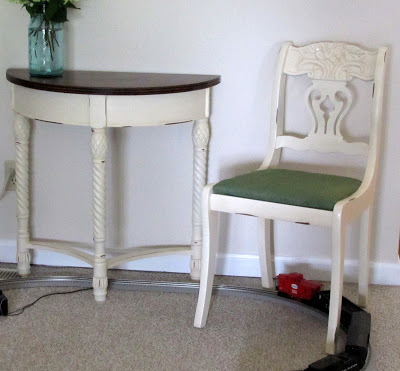 Please come by and link up to Vintage Suitcase Friday!